In order for driver assistance systems to operate reliably and safely, they require information about a vehicle‘s exact position and the surrounding environment. However, the current satellite navigation systems do not meet these requirements sufficiently. The OECON roadside navigation station provides additional integrity information from various available sources, in an automotive-friendly format. This ensures high-precision positioning even when the reception of the signals might be disturbed. 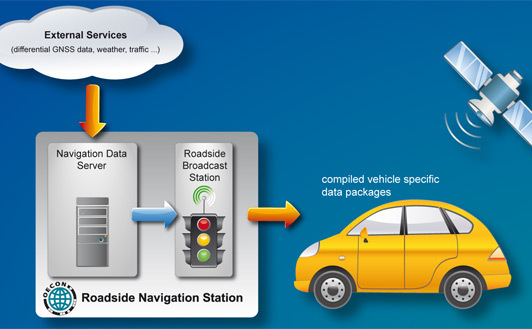 The roadside navigation station is already equipped for the future: data can be transferred in an extremely compressed format via UMTS or WLAN (in the future via WLANp). A built-in receiving unit will be standard in future vehicle generations. The Roadside navigation station is therefore well prepared for projects and vehicle applications that require reliable access to integrity information and correction data for satellite localisation, most updated maps and additional services such as local weather and traffic information.